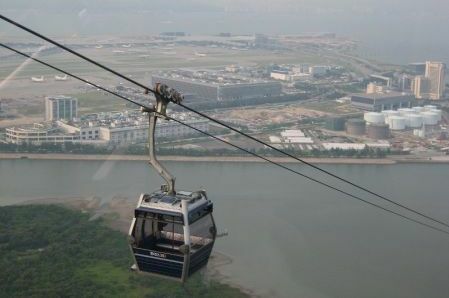 Experience the Ngong Ping 360 cable car! Discover Ngong Ping 360 - Hong Kong's new attraction. A stunning 7.5 kilometers cable car ride between Tung Chung Town Centre and Ngong Ping, Lantau Island and here's how to get there. Immerse yourself for the next 25 minutes @ 5.7 km. Hong Kong Ngong Ping 360 offers a journey of 360 degree spectacular panoramic views. This ride is from Tung Chung Town Centre down to Ngong Ping, Lantau Island. Encompassing bird's eye views of the South China Sea and Tung Chung Bay, Scenic Mountains, the Hong Kong International Airport, the whole North Lantau Country Park and introducing the Ngong Ping Village where you can visit the Tian Tan Buddha Statue and Monkey's Tale Theater. Here's the Ngong Ping 360 route map and nearby tourist attractions. This World-Class Tourist Attraction was officially opened to public on September 18, 2006. For safety and reliability, the HongKongNgong Ping 360 cable car utilizes the bi-cable rope technology which has less environmental impact and offers a very smooth gliding transit. A total of 17 persons are allowed in a single cabin car with only 10 sitting capacity, the rest will be standing. This very unique attraction is operating from 10:00am to 6:00pm on weekdays, 10:00am to 6:30pm on weekends and from 9:00am to 6:30pm on Special Holidays. Here's the most efficient way to get to Ngong Ping 360. 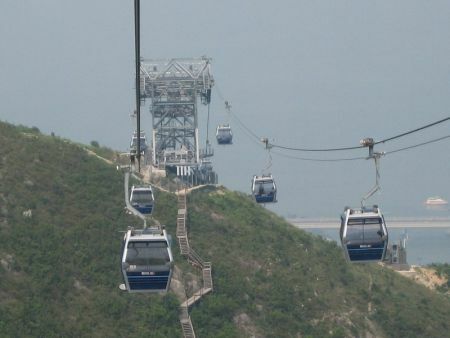 Ngong Ping 360 Cable Car Terminals are situated in Tung Chung and Ngong Ping, Lantau Island in Hong Kong. From Hong Kong International Airport, get on the Airport Express Trains for a 13 minute Airport To Tsing Yi trip (HK$60). And then another 14 minute trip from Tsing Yi all the way to the last station, Tung Chung Station (HK$14) and find Exit B. From Lo Wu (if coming from Shenzhen China), Get on the MTR Trains (read train safety tips) with a 33 minute ride to Kowloon Tong Station (HK$33). Take an exit to subway for MTR Trains concourse. Get into the Kwun Tong Line going to Yau Ma Tei but you should get off at Prince Edward Station. Walk to the opposite side of the platform and get on Tsuen Wan Line going to Tsuen Wan and then disembarking at Lai King Station. Finally, change trains for Tung Chung Line / Disneyland Resort Line going to Tung Chung (HK$17) and walk through Exit B to Ngong Ping 360 Terminal. From Lo Wu (if coming from Shenzhen China) MTR Trains and Bus alternatives follows. Get on the MTR Trains with a 4 minute ride to Sheung Shui Station, the 1st station from Lo Wu(HK$20). Walk thru Exit D1 (Landmark North) to the adjacent bus stop. Get on Bus No. 279X going to Tsing Yi ( around about a 30 minute ride for HK$12.5) and get off at Tsing Yi Bus Terminal, a few meters from there you can find the Tsing Yi MTR Station. Take the Tung Chung Line/Disneyland Resort Line going to Tung Chung (HK$14) and walk thru Exit B to Ngong Ping 360 Terminal. For complete information about NP360 ticket prices and special packages, please visit the NP360 ticketing page. Important: If you're already in Tung Chung and for any reason you decide not to take the Cable Car, please be informed that there's an alternate Bus route from Tung Chung to Ngong Ping. Board on Bus No.23 from Tung Chung Town Centre Bus Terminus (close to Tung Chung MTR station or adjacent to the Citygate Outlets) to Ngong Ping Bus Terminus, 48 minutes @ HK$17.2. And, from Lo Wu (if coming from Shenzhen China) when you want to go directly to the Giant Buddha, here's the best route. Take the MTR East Rail Trains for a 42 minute ride all the way to East Tsim Sha Tsui Station (HK$36.5). Interchange trains to MTR Trains, get on Tsuen Line towards Central and get off atCentral MTR Station(HK$9). Exit and get on-board the Ferry to Mui Wo, Lantau Island (Mon-Sat: Ordinary Class (HK$11.3) and Deluxe (HK$17.8), Sun and Public Holiday: Ordinary Class (HK$16.7) and Deluxe (HK$26). A few meters away, you can get on the Bus No.2 to the Giant Buddha at Ngong Ping Village (Mon-Sat (HK$16) and Sun/Public Holiday (HK$25). Here's to read more information about getting to Ngong Ping 360 thru MTR Trains specially if coming from Kowloon area. More inquiries and reviews about Ngong Ping 360. Wanted to ask or share something about Ngong Ping 360 attraction? you're welcome, the space below is for you! Enter Name of your Comment or Inquiry. Entering your post is easy to do. Just type it! We are coming from macau, and we want to go to Ngong Ping 360. how to get here? Thank you.